I am joining a wonderful group of ladies and reading through How to Have a H.E.A.R.T For Your Kids by Rachael Carmen. The book club this past week and we read Chapter 2, Enrich Your Marriage. I really enjoyed this chapter. My husband and I have been married 11 1/2 yrs. We have had our ups and downs. We have struggled through numerous moves, illnesses, job issues, financial stresses, broken down cars, a foreclosure, a bankruptcy, an addiction and family issues from the past. But through it all we remained strong and never gave up on our marriage. When I met my husband 12 yrs ago (yup if you do the math you will notice we only dated 6 months) I knew he was the man for me. I never dated in high school and never had plans to get married. I wanted kids but was going to adopt. And then I met Ben. We met in December 1999. His sister and I were good friends and had plans to go to the movies after work one evening. She asked if Ben could go along because he was going through a rough time and needed to get out of the house. So we all met outside of The Sports Authority (which is where his sister and I worked) and headed to the movies. I had met Ben previously because he was engaged to another girl who used to work at The Sports Authority but that rough time I mentioned was because him and his fiance were taking a break, or so I thought. Boy did I forget how good looking he was. I decided to flirt and he did too. He was on a break from his fiance so he was fair game right? I mean he wasn't married yet! Well I found out later that night that they had totally broken off their engagement. YAY he was fair game. So about a week later I went over to Ben and his sisters house for a Christmas party where we flirted some more and then he made his move. His pick up line, "I think you're pretty cool and I would like to get to know you better." My reply, "okay well lets hang out I have your phone number I will call you." And I did the next night and we went out on our first official date. Christmas Eve arrived and we spent it together he gave me a leather coat for Christmas. Yup I only knew the guy a couple of weeks and he gives me a leather coat (he was definitely a keeper). He spent Christmas at my house. And we continued seeing each other every night. Most nights we would just snuggle and watch movies or play video games which is still our favorite thing to do. June arrived and we were going to the beach for my birthday. I didn't know it at the time but he had plans to propose. He had the ring and had it all planned out. But a few weeks before our mini vacation we were talking and somehow we got on the subject of eloping and getting married when we went on our vacation. "Umm there is no way my parents would ever go for that," I said. The next day while I was at work I called my mom and half joking told her we were eloping and getting married at the beach. My moms reply which stunned me was, "well if that is what you really want." WHAT????? So Ben and I decided to get married at the beach and we started planning. We found a pastor online, Pastor Bob and I found a cute white dress (on sale for $80). About a week prior to our wedding he actually popped the question (even though he already knew my answer) and gave me the ring. We drove down to apply for our marriage license the weekend prior, everything was set. WOW I was getting married. 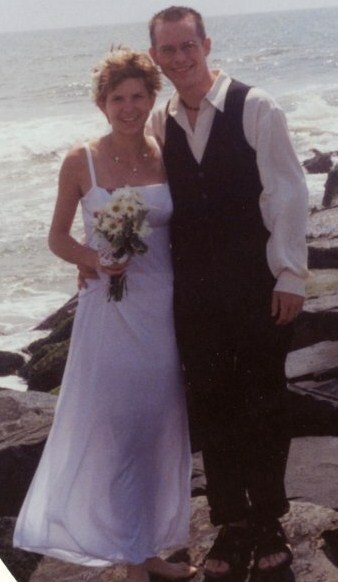 On June 16, 2000 also my 19th birthday we got married in Harvey Cedars, NJ on a jetty. Just me, Ben the Pastor Bob and our two witness which were my sister and brother-in-law. It was the most amazing day of my life. I had found my soul mate. Who would have thought that the first guy I dated would be the one? We had a lot of people tell us that our marriage would not last because of how whirlwind it was. But here we are today happy and together. We have also brought two wonderful kids into this world to share in our journey. When we said our vows we meant them . Every marriage goes through rough times it is just human nature nothing can be 100% perfect all of the time. The hardest struggle for us has been Ben's past family issues. He grew up in an environment with emotional and physical hurt towards him and his siblings This hurt has stayed with him through the years and has caused re-occurring issues in our marriage. But each time we work through it together. We have gone to counseling and we have read together (The 5 Love Languages is an amazing book). We have worked on our communication BIG time. Communication is such an important key to marriage and I think probably one of the biggest reasons marriages fail. It is actually because of a rough patch in our marriage in 2009 that I started my relationship with God again and started praying again . Rachael, ended the chapter with some questions called, "Heart Check-up"--Page 89. Here are answers to a few of the questions, because I didn't want my post to be overly long. 2. How would you like to see your own marriage improve? What are you personally willing to do to start making those changes? 3. Describe the kind of marriage you would like your children to one day experience. How are you helping to prepare them now for those relationships? How are you praying for them and their future spouses? I want my kids to have a safe and happy relationship with their spouse. I want them to know that marriage is something you work at that its not easy. I especially want my daughter to know that its not like the fairytales she watches, lol. We are very open with our children. We don't hide the ugly or good stuff from them and we have cried, had arguments, kissed, hugged and acted silly in front of them. I love it when my daughter sees us kiss and says, "Awww Mommy and Daddy are in love." Normally my son runs and says EWWWWW! Honestly I never thought about praying for them or their future spouses that is something I will start doing though. 5. What is one thing you could do today for your spouse that could make all the difference in his or her day? I need to be better at listening to Ben and communicating with him. I need to do a better job at filling his love tank by expressing his primary love language which is physical touch. Physical touch is hard for me but since it is what he craves I need to make more of an effort to kiss him everyday when he comes home, rub his head and back, hold his hand and hug him. Opps thats two things. -Pg 64 - "There are so many lessons and insights that can be wonderfully demonstrated in the context of marriage - selflessness, sacrifice and service, just to name a few." -Pg 66 - "It is from watching their parents' marriages that our children learn trust, sacrifice, loyalty, teamwork, forgiveness, cooperation, communication, and responsibility. It is from our marriages that they learn perseverance, joy, diligence, kindness, gentleness and communication. It is from our marriages that they learn grace." -Pg 79 - "You know when you're young, no one tells you how hard life is going to be, much less marriage." Live, love and laugh together often! I cannot wait to read everyone's posts. Thanks for stopping by. great post Kathy! It's amazing how easy it is to get married - and then how much we complain when it gets tough. SO glad that you married your soulmate - it makes all the difference!! Glad that we are on this journey together! Eloped on the beach? COOL! Sounds like you two are a match made in heaven! Thanks for sharing your story, and your thoughts. I also am enjoying this book / book club. Blessings! I enjoy reading how couples met and married! It's wonderful to read how you all really face things and talk them out--it speaks to the themes in chapter 2--respect, love, and good communication. I chuckled at your child saying, "ewwwww". My 11 yo daughter goes, "Oh, nooooooo" I started praying for my daughter's future spouse this past year--as she has gotten older(something about surpassing 10 years old), I realize that it passes all too quickly. Love ya and can't wait to meet up at Live in Atlanta! What a story! We read the 5 love languages book when we were engaged. Great help to our early years of marriage. It's funny we were dating and planning to marry about the same time as you and your husband. But we met in 1996 though and split up for 3 and a half years. Then got back together in June 2000 and married March 2001. Great post! So glad to have met and getting to know you! So interesting to hear how y'all met & eloped!! I joke with my kids that might be cheaper, but what a giant leap! I love the beach~so glad you did it at the beach:) Cute picture! Thank you for being so upfront with issues you and your husband have had to deal with. It is hard to deal with baggage, yes? We are a blended family and sometimes it takes so much work to understand each other. But so worth it! !